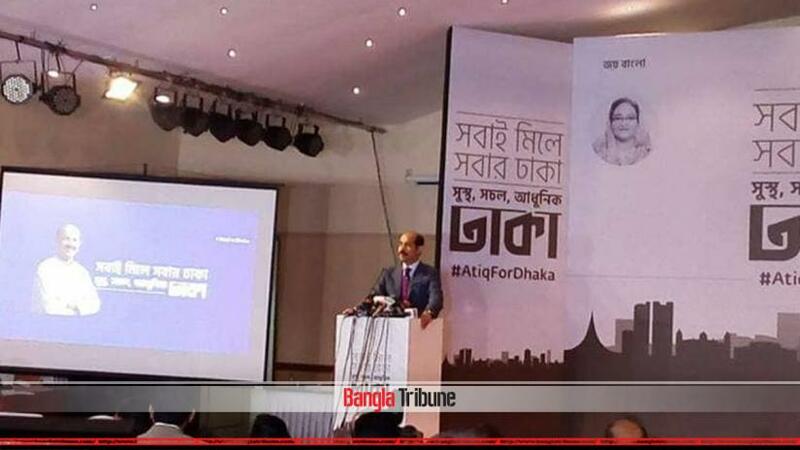 Awami League candidate for the Dhaka North City Corporation (DNCC) mayoral by-polls Atiqul Islam has pledged to digitalise the city transport system in his manifesto. Atiqul unveiled the polls manifesto on Tuesday (Feb 12) at a hotel in the capital’s Gulshan. He said that should he be elected as the DNCC mayor, he would ensure controlling traffic system digitally, receive and solve complaints from citizens through apps and completely digitalise the city’s transport system. “I want to join hands with the citizens to solve the problems,” he said, adding that if everyone does their part the city will soon be modern and developed. In his manifesto Atiqul also pledged to implement deceased DNCC mayor Anisul Huq’s plans in addition to ensuring playgrounds, upgraded drainage system amongst other things. On Jan 22, the Election Commission fixed Feb 28 for the Dhaka North mayoral by-election and polls to elect councilors for the 36 new wards to the North and South city corporations. The office of the Dhaka North mayor fell vacant after the death of Annisul Huq on Nov 30, 2017. The EC’s announcement of the schedule for the by-polls came six days after the High Court scrapped a stay order on it. The Commission had last year announced that mayoral by-polls for Dhaka north and the new city corporation wards will be held on Feb 26. However, the process faced roadblock after Ataur Rahman and Jahangir Alam, Union Council chairpersons of Bhatara and Beraid, filed a petition challenging the decision over their unions being added to Dhaka as city corporation wards.